This beautifully restored old tug was berthed at Troon over the weekend, and was due to leave again this morning for Oban. 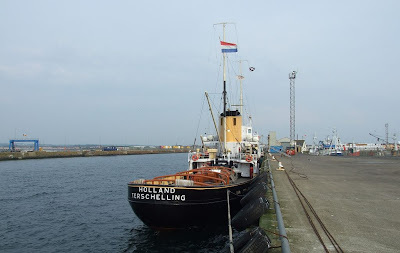 Currently on a tour round Scottish waters, HOLLAND dates from 1951, when she was built by Ferus Smit at Foxhol for Rederij Doeksen as a deep sea salvage tug, and passenger ship capable of accommodating 700 passengers (yes, 700!) 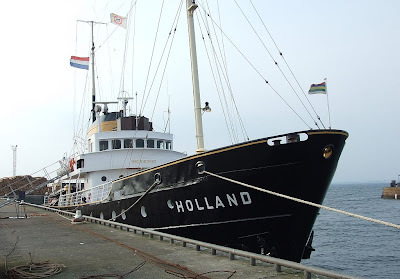 while serving the islands of Terschelling and Vlieland from the mainland. After a career spanning 25 years, she was chartered to the Rijkswaterstaat (Dutch Water Department) and served with them until 1998. By that time, the 57.35 metre long vessel was surplus to requirement, and advertised for sale. A trust was set up, and she was taken into preservation with considerable assistance from the Dutch Government, and several companies and other institutions. Now operating as a working museum, she has been largely restored to original condition, still retaining her 10-cylinder Werkspoor main engine. I wondered what she was doing there, thanks for all the info. The tug "Holland" our museumship is making a trip in the Scottisch area with passengers. Every 5 days a new coupple of people are coming aboard. The ship is leaving at hte last week of may. Homeward bound. www.hans-biersteker.com I have a few pages about this trip. Currently sitting in Lamlash Bay, Isle of Arran. Might pop out in the RIB and have a look around it.